#1. Don't discipline in anger. As single moms, we're exhausted and at our max a lot more often than you'd like to be. But when you're disciplining your child out of anger or frustration, they're not thinking about their own actions as much as they are watching you flip out (and figuring out how to avoid you in the future). If you need a minute, it's okay to tell them that you will address the issue when you've had a little time to think about it. Better to take 10 to come up with a meaningful strategy, rather than acting out immediately only to have them completely miss the point. #2. Follow Up. On the list of things-I-don't-have-time-for, checking to see if my kids actually brushed their teeth when they said they did ranks way up there. 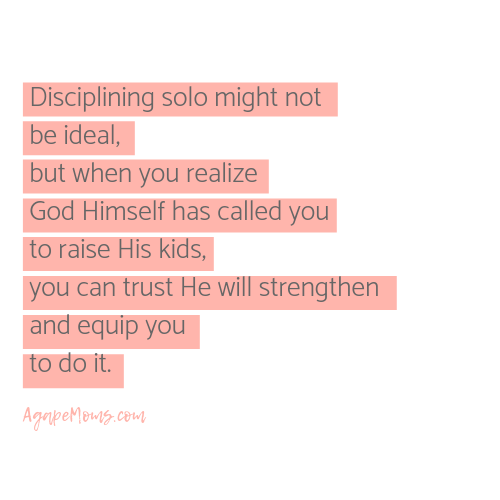 But to build a child's character, it's important to find out if he or she is growing in integrity, or if they’re using the fact that you are stretched thin to their advantage. DS says there's no homework this week? Verify with the teacher. It's in his best interest that you catch and address manipulating behaviors sooner rather than later. #3. Stay Consistent. I know there are times when you know the infraction was small, and you really don't have the energy to dole out a consequence. But when you're not consistent with the little things, your kids figure out that there's a game of "Discipline Roulette" going on. They're thinking, "will she really take away my toy/phone/screentime if I do this? Let's see." They are more likely to push your boundaries if they aren't sure where the lines are. Having rules and enforcing them consistently teaches your child respect for authority, and provides a sense of security and trust that you mean what you say. #4. Admonish, but encourage. As much as we don't want our kids to fail, oftentimes we learn more from the process of correcting mistakes than if we'd gotten it all right on the first try. And while this doesn't mean you let them do whatever they want, expecting mistakes means you are less likely to get personally offended, so you can address the child's behaviors and attitudes in love. What we’re after is a change in the heart that ultimately turns a child towards a life in Christ, not just meaningless changes in behavior. Consequences are necessary, but good discipline should also leave the child encouraged that he/she has the opportunity to try again, with a foundation of your love and support. Just as your mistakes don’t define you when you are in Christ, neither do theirs. #5. It takes a village. Isn't it strange how you can tell your child something, but they won't listen until they hear it from someone else? Single or not, parenting should always involve creating a healthy community of trusted adults your child can relate to (because let's be honest, they get tired of us sometimes). Look for members of your family, religious organization, or community that you know have successfully raised children who are willing to spend time with you and your kids. Kids love knowing they are surrounded by people who want to see them succeed, and building a community of people who understand your unique needs as a single mom will help you heal and de-stress (which will also make you a better mom). This post was featured on Today (yes, THAT Today!). If you head over there, you can give us a vote and help others discover the love, support, and community we have here at Agape Moms. Are these tips helpful? 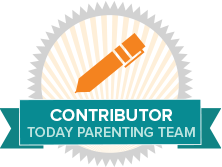 What struggles have you encountered parenting alone? What tips would you add?